Via this news article. Thanks, foo2rama! 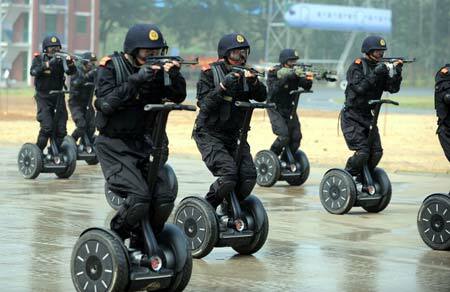 Modern day keystone cops, but probably not as effective. Although they might be able to grab the bad guys while they are still rolling around on the ground trying to get control of their emotions. One big bump and they can forget about having a family! Shown here having to pee so bad they’re hiding their faces in embarrassment. Or…wincing in pain from having to stand on their new giant bionic testicles.. They have located the location of our Achilles heel. We will say “Ni” again to you if you do not appease us. Hmmmm, very bizarre. It gives me flash backs to the movie WALL-E where people no longer walked but lived in floating laz-i-boy chairs!